How to add one or more additional lights, so that all are operated from the same switch. To add a second light which is switched with the first one, the switched line, neutral and earth need to be extended to the second light. 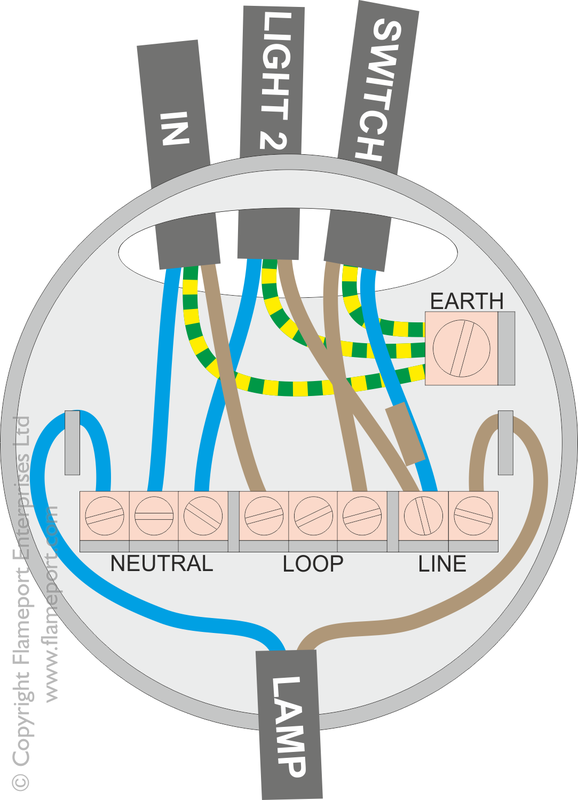 This diagram shows the additional cable connected to an existing ceiling rose. The new cable here is labelled 'light 2'. The other end of this cable is taken to the position of the new light. Loop is not required at the new light, as this is only used to join the incoming power and the switch cable, neither of which exists at the new light. 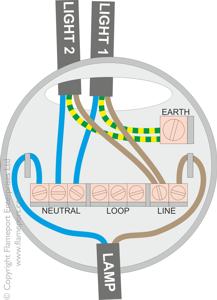 Connections at the new light fitting are just line, neutral and earth. There is no connection to Loop. This light will only have power when the first light is switched on, and therefore will work in the same way as the first one. This concept can be used with ceiling roses as shown here, but the same principles apply to other light fittings including downlights. 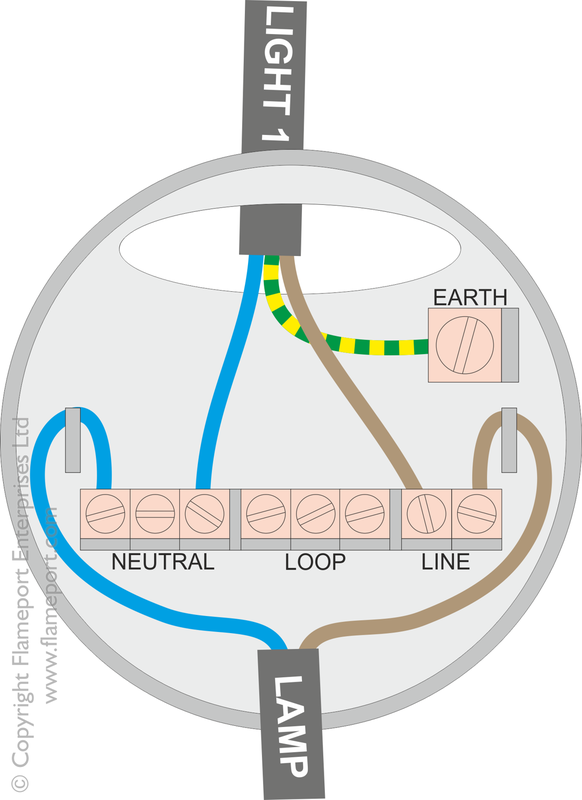 As with the other lighting diagrams in this section, the first ceiling rose could be a junction box instead, or could be connected via the 'loop at switch' method. If three, four or even more lights are required to be switched from a single source, the new cable can be extended to as many lights as required. 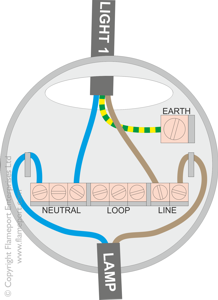 Here the ceiling rose is shown with two cables, both of which connect to line, neutral and earth with no loop connection. One cable connects to the previous light, the other continues to the next light. 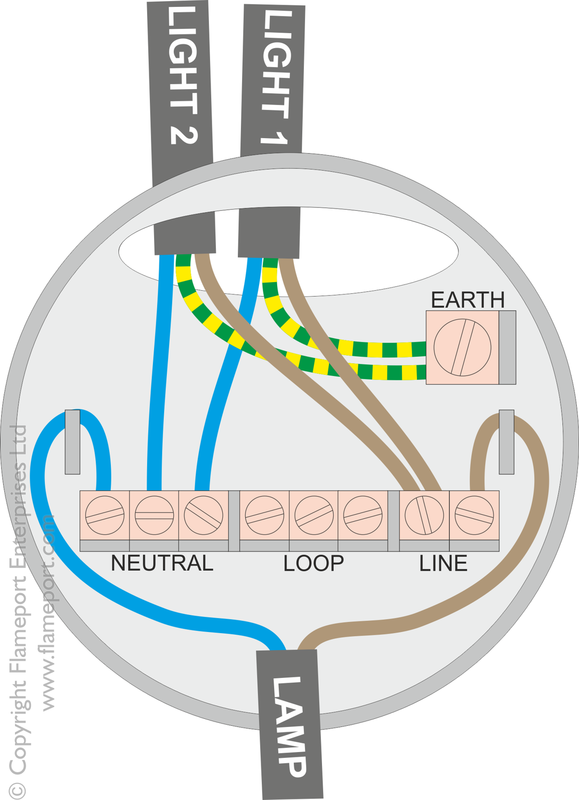 Note that if using ceiling roses as shown in the diagram, it will be necessary to put two wires into a single terminal for the line. It will also be necessary to do this for the neutral in situations where there are already 3 or more cables connected. This is completely acceptable, although more care is required to ensure both of the wires are securely held by the terminal screw.